Ultrasonic industrial cleaners with frequency changeover. Two frequencies (25/45 kHz or 35/130 kHz) can be manually changed over for intensive and gentle cleaning in the TI-H ultrasonic cleaners. Thereby, the first frequency pair (25/45 kHz) is ideally used for cleaning hard surfaces such as metal or glass. For the second frequency pair, oils and greases on hard surfaces can best be cleaned using 35 kHz and sensitive surfaces such as from the jewellery or electronics can best be cleaned using the high frequency of 130 kHz. 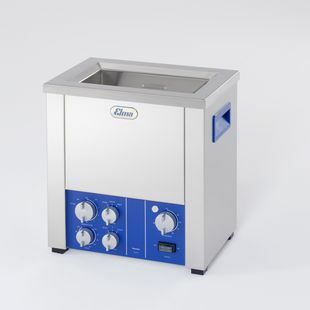 Manually welded cleaning baths made of particularly cavitation-resistant special stainless steel ensure long durability of the equipment and enable robust use for different industrial applications.